"Father Nature" gives presentations, programs and outdoor field trips for schools, churches, retirement homes, libraries, senior groups, social clubs, and non-profit groups. "Sensing the Seasons" is a very popular choice for adults. Teachers especially like "You Can Haiku Too!" People in the Creative Arts especially like "Learning to See". "Wildflowers ~ Collected by Richard Havenga"
Intended for Garden Clubs, Nature Centers, etc. "The Poetry of Nature ~ The Nature of Poetry"
Intended for college classes & adult classes. richmaryh@gmail.com for details on fees and scheduling. "Secrets of Summer" & "Photo Poetry"
August 14, 2017 @ 11:00 a.m.
August 23, 2017 @ 2:00 p.m.
August 22, 2017 @ 1:00 p.m.
"A Congregation of Birds" & "Photo Poetry"
September 19, 2017 @ 7:00 p.m.
"Artistry of Autumn" & "Photo Poetry"
September 21, 2017 7:00 - 8:15 p.m.
September 22, 2017 @ 1:00 p.m.
September 25, 2017 @ 2:00 p.m.
September 27, 2017 @ 2:00 p.m.
October 24, 2017 @ 1:00 p.m. Your work is beautiful and moving -- such incredible photos and lovely poems revealing your wonderful sensitivity and soul and your pureness of heart! Your poems and photos remind us to take the time to experience the beauty of nature and realize the gifts we have been given. Blake and Emerson both wrote of seeing things well -- as Ruskin did. You do see things with a "good eye" and capture the essence of a "moment." I was reminded in one of your poems of Walt Whitman -- it was the poem entitled "You". It reminded me of Leaves of Grass. You invite the reader to enter your world by listening to your words and seeing your photographs. "Go with me on my journey." "Walk with me." Those are the quiet invitations offered. I just found the entire experience refreshing and educational. "Thank YOU, Richard for your wonderful presentation yesterday. Your photography is breathtaking! You have a special gift for sharing the subtleties of God's creation with amazing detail and intensely brilliant color. And your poetry adds a richness and depth to the feelings your audience would be unable to so eloquently express. It was truly a delight to have you join us for our event - your audience was spellbound. I will definitely recommend you to others." Mr. Havenga presented his "You Can Haiku Too!" program to our 7/8 grade students. He was able to relate to the students on so many levels. We all appreciated his willingness to share his talents so generously. From his amazing photography to his inspirational words, to his personal story, Mr. Havenga truly enriched us all with his presentation. He truly has a gift for capturing the beauty of our earth and bringing out the poetic voice in others. What a delightful time we had with you at Women's City Club. Our ladies loved your presentation: "Sensing the Seasons": "Secrets of Summer", and "Artistry of Autumn". The photos were so clear and beautiful. Your Poetry was so expressive and fitting to each nature scene. Thank you for your program to Grand Rapids Audubon Club Monday evening. I keep seeing your marvelous images of birds in my head. Also, I sincerely appreciated the Poetry part of the program. You have a marvelous voice for reading; and the fact that you were reading your own works added a tangible layer of richness to the evening. Thanks so much for the moving and beautiful program "Learning to See", presented to Ottawa County MARSP (Michigan Association of Retired School Personnel) members. Your photography represents a gift you have been granted, a gift to see nature in unique ways, and then capture it with your camera in a unique way. It is obvious that your photography is complimented by your gift of writing - utilizing words in ways that so beautifully represent the often "unseen" elements within a photograph. You mixed music, photography, a soft and tender voice, and beautiful words to deliver a moving presentation. The reaction and feedback from our membership was affirming of my own impression of a job extremely well done. Blessings to you as you explore additional ways to use your gifts with groups or through classes. I will never look at God's nature in quite the same way after experiencing this presentation. I wanted to thank you for the beautiful pictures, poetry, and stories that you shared with our group. We had a delightful experience as we took a "Walk With Father Nature". ~ Robin Johnson - President - Belding Gardeneers. "Nature Journaling" session with Knapp Charter Academy Third Graders. 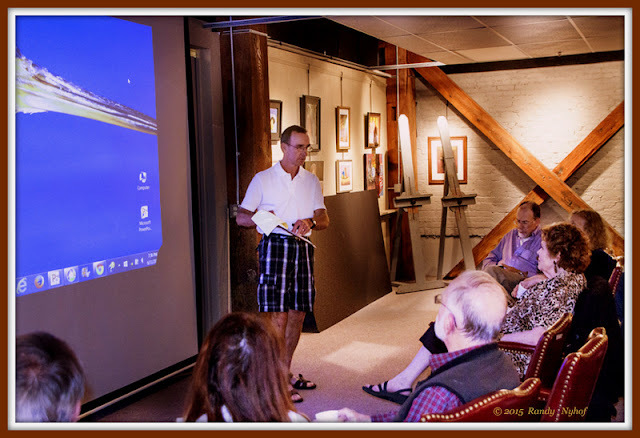 as Poet/Photographer Richard Havenga reads his poems and shares his images. Travel through the seasons and around the U.S. on this journey with words. This program is for anyone who enjoys art, nature, writing, photography, music, and non-fiction. I will share my Nature Photography through the seasons while showing you how to slow down, reflect, and observe with awareness and focused curiosity. Learn how to enhance your time when you go outdoors. Nature is a soothing, comforting place to find inspiration and outlets for personal expression. During this presentation, I will also share my philosophy, favorite poets and authors that will help participants in "Learning to See". Audience participation and discussion is strongly encouraged. Audience: High school, college, & adults. Call: 616-691-7878 Home, 616-250-8943 Mobile, or Write: richmaryh@gmail.com for details on fees and scheduling. Rich Havenga's visit to Porter Hills was a perfect "trip" away from the cold, gloomy, rainy afternoon that day. I was so impressed with his Photography and Poetry. I loved that he was so personal and enthusiastic, and his passion showed! He brought the images of his Autumn experiences in for us who are unable to get out to enjoy them. Thank you for the thoughtful "Learning to See" presentation to our Seniors. The photos, narrative, soothing music and poetry reading was inspiring. God has gifted you to share the beauty of His nature with others. Thank you!" Thank you for stimulating my students' minds with your beautiful photos. I loved how you encouraged the use of active verbs and specific nouns to my fourth grade class. They were so proud to share their "published" work. You made them comfortable and motivated to marvel at nature and grapple with the word choices available to them as writers." Thank you so much for coming to Raybrook Manor to share "Spectacle of Spring" with us. The gasps from the audience at each new slide said it all - your photographs are spectacular and a beautiful testament to an imaginative and generous God. Thank you for sharing your gifts of a careful eye and studied knowledge with us as well as the creativity of your written words. Thank you again for presenting to our "Learning Cafe" group. Your Photography, Poetry, and admiration of nature and deep faith in God was very inspiring!" Power Point presentations with classical music and optional narration. 30 - 45 minutes duration, plus discussion, and Q. & A. session if desired. You Can Haiku Too ! You Can Haiku Too ! is the most popular program for Teachers and Students. This is adaptable for upper elementary, middle and high school students. It works well in a Writing Workshop setting. See details below. 1. Read Haiku - From approximately 100 examples available at "Walk With Father Nature", I will read several of my Haiku to the students while they listen and observe the Photo~Haiku. Topics include: birds, mammals, reptiles, wildflowers, trees, clouds, landscapes, etc. 2. Learn Haiku - Using Nature Photography from my Picasa collection as prompts, I will ask key questions to stimulate students' writing and creativity. We will employ "clustering" and "mapping" for idea generation. 3. Write Haiku - While viewing selected photographs, students will create their own Haiku. The Teachers and "Father Nature" will rotate around the room to assist students with revision. 4. Share Haiku - Students will volunteer to read aloud their best work, or have it read by an adult. 5. Publish Haiku - Teachers will determine how (and if) they want to compile a class Haiku collection / anthology.